First, A boat sank while docked on Stephen Jemals property at the old riveria marina and as a result the gas and oil leaked into the creek. The coast guard was notified and filed a report. 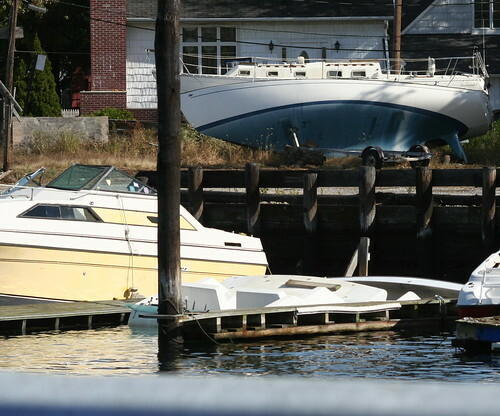 Separately, On the same property a sailboat dry docked flipped over and is resting on a utility pole. Then, the docks that were supposed to be cleared away or face stiff fines from the DEC, have started to float away and have now have ended up at various parts in the creek becoming navigable hazards. Even more horribly an ETO worker was seriously injured, while working for ETO, receiving 35 stitches in his forehead and is facing personal bankrupcy, due to the resulting medical bills. Looks like ETO has turned out to be a disaster on the property. Your recent article “ETO Creek Disaster” is grossly inaccurate and we would like you to make the necessary edits. 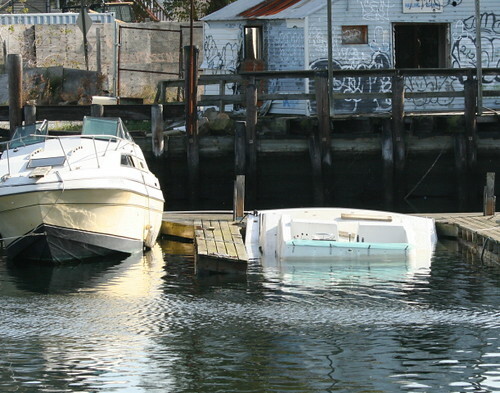 This boat had nothing to do with the ETO – there must be other people that were given permission to use the property. We haven’t began or anticipate beginning any work on these docks. I appreciate what you are trying to do here and your website is a great way for the Gerritsen Beach community to stay current with events. However, if you want to be a quality investigative reporter you should really do you homework before publishing anything. is there any insurance on this property? who is responsible? someone can be killed? what happened to the D.E.C. fines? throw the bums out. @Darren, THOSE PEOPLE ARE A COMPLETE FRAUD. IS THERE INSURANCE ON THE PROPERTY? JEMAL DOESNT CARE ABOUT SAFTEY! THEY SHOULD BE PICKETED!! Could you please do a spell check the next time you post something? There were a lot of typos on this story. Hey, thanks for reporting community news, even with typos. Your effort is appreciated! @S C, Actually it can be explained. I posted the above using my palm phone. This was not an easy task! To get techy…. has anyone even tried to load wordpress admin on palm (shoot me in the face) OS 5, using Blazer! On the blazing slow edge network while at JFK HA! I did a decent job for how I did it. I’m editing now. Hehehe, I used to be spelling Nazi but I gave it up. Now I look for quality in meaning, not as much in presentation. You cant spell either! Read your last sentence! Gerritsen beach.net keep reporting, your doing a great job.Why isnt the ETO keeping there promise to clean up the mess? Maybe because they cant scam anymore money from people?Heard they are renting space at Riviera to store boats for the winter.Are they allowed to run a marina there? While all this BS goes on, the oil and gas continue to leak into the creek. News 12, GBPOA, ETO, Jamal. The finger pointing has got to stop long enough for someone to take responsibility and do something about it before it looks like the Gowanas or Coney Island creek. Shouldn’t the DEC have the authority to force Jamal to DO SOMETHING? The DEC is hedging and not doing there job. First Fines now no Fines they are doing nothing What does DEC stand for>Do nothing for Enviornmental Conservation? ETO, Jamal , DEC whats wrong whith this picture. the DEC is not doing there job while the creek is being destroyed. something smells and its not dead fish .some one call the governer.the Dec should change there name to fish squad. DEC do your job! Where are the local political officials.Why aren’t they putting pressure on the DEC to do something. Its enough! Mr. Lew Fiedler? Marty Goldin? Hey Berardelli, These ETO People are your supporters. .Where are you guys????? A boat was loose and drifting in the creek just yeserday. Do we have to use our resources for nonsense like this? 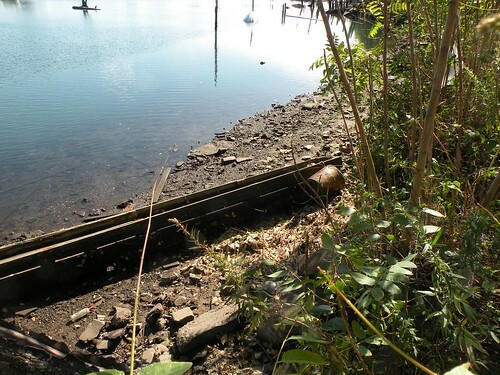 (NYPD harbor to return the boat to Jemals docks? Bravo to Frank! You are so so right. We need more people like you to speak out.